This blog has been strangely silent for many months, its muzzle buried in its paws. The reason? It was on sabbatical. ‘Sabbatical’, is one of those well-bandied terms, that cast a veneer of professionalism over an otherwise less salubrious truth. It is not dissimilar to the word ‘Retreat’, which nowadays stands for a company piss-up after a day tinkering with a yoga strap in order to better connect with your colleagues. Not far behind it, lurks ‘Inappropriate’ – a word that hides such a multitude of other meanings as to deserve a post in its own right. Little Johnny whacking his mother with a stick is not inappropriate, it’s bloody outrageous but ‘inappropriate’ determines a moral high ground – endowing the speaker with a sense of unassailable and dispassionate objectivity. Still, for some, sabbaticals are the genuine article, like for an old friend who found university too dull to complete, started his own company and sold it for millions. Linked In tells me he has been on sabbatical for a good two years. The content of his Facebook page confirms it – with a string of leisurely images of Paul, copy-pasted and beaming, beside various world leaders. This is the same friend who only made it to our wedding because he won a late-night game of poker, allowing him to catch the first flight to Italy and materialize minutes before I walked down the aisle – my stockings gamely relinquishing their grip on my thighs. But in my case, the sabbatical was induced by a misdirected fragment of marital attention in the form of a cartoon from the New Yorker. The cartoon, which has been sitting on my desk for two years, pictures two dogs (Labradors) conversing. One confides: “I had my own blog for a while, but I decided to go back to just pointless incessant barking.” This, rather like the shotgun of a local farmer, had the effect of quelling any appetite I might have had to yap into the virtual night-time. It is more than likely that the purchase of the card was intended to quell a rising sense of guilt at having bought yet another pair of Parisian shoes with beautifully sculpted toes, hand punched contours and a delicate hand-buffed finish. As a present it beat the iPhone case from Charles de Gaulle airport, ripped from its plastic housing amidst a downpour on our way to school pick-up. That was my 39th birthday. Presents and present giving is a not big thing amongst my in-laws. 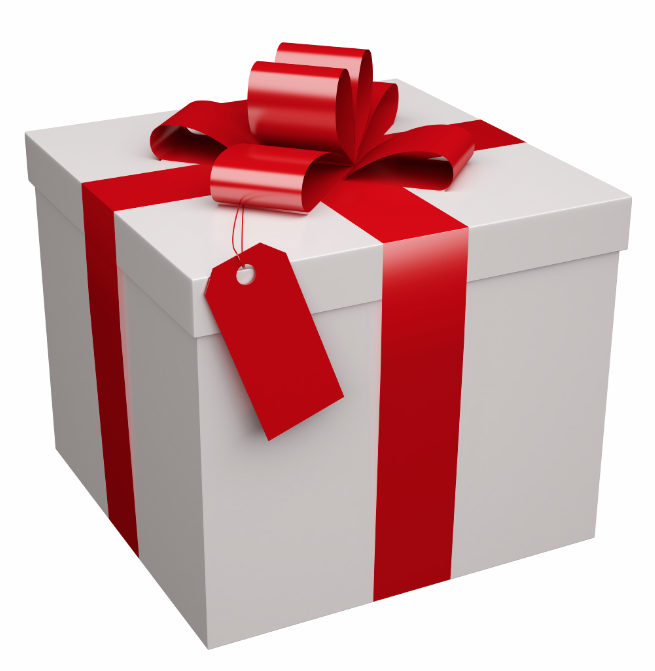 Presents are typically handed over the roof of a car at Schiphol airport and consist of clutches of clothes hangers, thermal undergarments or whole assemblies of fingerless gloves – in the era before they became useful as smart phone accessories. However the most famous instance of all, is the present my unfortunate brother-in-law received for his 21st. Whilst his peers at St Andrews were celebrating their coming of age as the happy recipients of their first VW Golf GTI, Jan was told with the beaming enthusiasm and earnestness of the do-gooder, that he was the happy recipient of a boat. The boat, however, came with some genuine baggage. In fact it came complete with a Senegalese fisherman by the name of Babu with wandering hands. 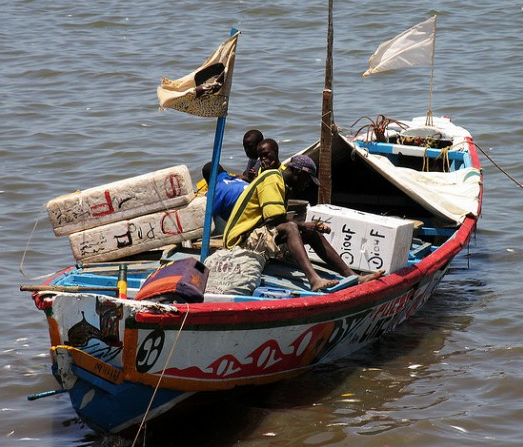 The boat was also thousands of miles away on the coast of the Casamance but the future was bright, as bright as the West African sun, and as soon as Babu had paid off the price of the boat, Jan could hope to be the happy venture capitalist behind a pile of dried shark fin. Until then he had a miniature of the boat to float around in the bath. Apart from the lop-sided model clogged with soap, little materialized from this arrangement except for one brief outing during a survivalist holiday in the family mud hut. Babu, perhaps keen to be rid of his creditors, encouraged Jan and myself (pregnant as it turned out) to swim in the surrounding shark infested waters. Jan pointed out with a certain amount of sense, that if he typically fished for shark then was there not a risk of shark in the water? With a wave of the hand that was not engaged in caressing a young female breast, Babu reassured us that the current was going the other way. We swam gamely on until a giant jellyfish drifted by, at which point, feeling enough was enough, we lugged ourselves back over the side and spent several hot hours attempting to avert our eyes from spectacular caper going on at the stern. The entire episode sent me into a heavy fever for which the pith of boiled baobab was deemed the only answer, and administered with as much enthusiasm for local wisdom as the time-sharing boat deal. We are all familiar with the dull and moralizing ‘Be careful what you wish for’ – my daughter read just such a nauseatingly moralizing book last week – but there are cases in which one is perfectly blameless. Ill-thought present giving is a liability whether it takes the form of a wafer thin card with a bunch of talking dogs or a twenty-foot boat complete with wanderlust crew. It can lead you into shark-infested waters, or land you, beached and parched for words. It is time to move from Past Tense to Present Perfect. With one great woof, I’m back… until Christmas at least. THIS BLOG NEEDS YOU: A book is not a book without a reader – a blog without readers is a slog. Please comment or share. YOUR WORDS ARE GREATLY APPRECIATED. Evil Snack – Who’s Eating Who? Play dates, we have all had them, like the flu. The most memorable was when my six-year-old guest boldly cocked her head on one side and asked me for $20 to play nicely. At the other end of the scale I have had the blond curled amazon who made a several hour game of hunting down any resident stink bug and evicting it. But somewhere in between these two extremes there lies the lingering, directionless play date, which is by far the worst. The bored child who does not know what to do whilst your own child is absorbed in hanging from the top of a bookcase – lost in cosmic thought. Invariably the bored child sidles up interrupting a perfectly good session of aimless Internet browsing – one cannot focus on anything constructive with a play date in progress – and announces that it is ‘hungry’. Time to rise up from the swivel chair, repositioning my visitor’s steadfast eyes upon my navel, and announce ‘nutritional psychopath’. Food, or rather snacks have become the sad alleviator of boredom and the directionless moment. As a Legal Alien, I blame the Cheerio for starting all this. The Cheerio has since attempted to assuage its guilt by passing the baton to the Goldfish cracker which comes in a mesmerizing array of varieties that bear minimal differences to each other, bar the rainbow ones which look every bit like cat biscuits. 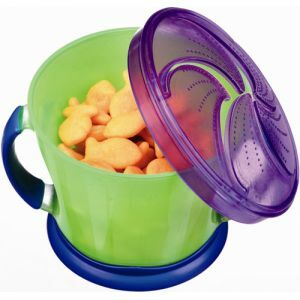 To make matters worse someone invented the snack cup and added the time-strapped adult. Active child, snack cup, gold fish = 20 minutes of sedation. The snack cup – which turned out to be a novelty when I pulled it out in London several years ago – allows your child to painstakingly extract one small snack molecule at a time providing prolonged brainless distraction. Snack has come to be used as a means of controlling and subduing one’s child. When it comes to groups of children, snack is used more liberally as crowd control. After a soccer game children are corralled with the lure of snack regardless of the fact that it is actually time to go off and have lunch. There appears to be a lurking fear that without these well-timed mouthfuls, the lurking Caliban in our children will be released. The problem is that continual snack as appeasement and sedation is actually backfiring. You find yourself confronted with Caliban at dinner and he is wielding utensils. Not surprisingly he is not hungry and not interested in trying anything new because he is not bloody ravenous. Ravenous is how I like them. Ravenous eats asparagus and second helpings of pasta. Socially it is a pain but health-wise not eating at the long-respected meal times is unhealthy and a cause of eating disorders, child hood obesity and dysfunctional family relationships. The evil influence of snacks on our children and the social beings we are raising has been my bugbear for some time. 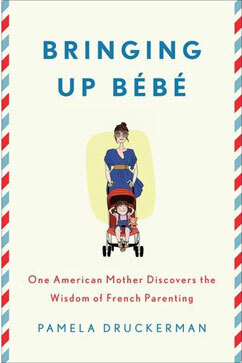 And so it was with some thrill, that I read an article in The Wall Street Journal reviewing a book by Pamela Druckerman about how the French make better parents. Whether this is true or not (apparently there was a violent reader backlash) the rule of allowing only one snack mid-afternoon, “le gouter”, makes total sense even for younger children. Remove the endless snacks and you might find that your child becomes a companionable dining presence with an enquiring mind and palate. Furthermore they are likely to grow up with a measured appetite, good biorhythms and not conditioned to graze from the cupboards during moments of boredom. Putting health aside, incapacitated on stretcher somewhere, and allowing etiquette to slip effortlessly under the table – might the preponderance of snacks have wider consequences for our social development? According to The Wall Street Journal article, we are failing to educate our children in the simple act of learning how to wait. Whilst sounding like my grandfather and probably his grandfather, doesn’t a little Spartan resilience build character and doesn’t boredom spark the kind of ingenuity that the quick sedative shot of a snack will not? 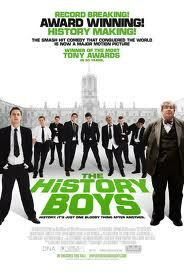 Is extracurricular eating beginning to shape not only our bodies but the way we live and who we are? According to a report by the United States Department of Agriculture, Americans spend 78 minutes per day engaged in secondary eating or drinking – which is more time than they spend eating actual meals. 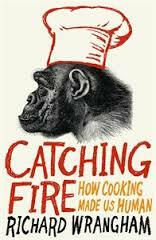 Michael Pollen, author of a series of books on how modern society and food intersect, recently published Cooked. The book advocates a return to the communal, home-cooked meal, which he argues, has exercised a civilising force on us for thousands of years – or two million to be precise. So what is to happen to a society that is rapidly returning to the state of industrial forager, first and foremost? 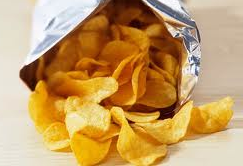 As roots and berries have been replaced by crinkly wrappers we will not want for calories, quite the contrary. But are we developing a generation accustomed to instant sensory gratification with no self-restraint? The Atlantic Monthly already cautioned us on the maturing generation of ‘teacup’ kids who require encouragement on a constant drip. Is snack just another emotional crutch? In fact hasn’t the time come to set an example and unplug ourselves from our 32oz lattes and mochaccinos? Isn’t the sight of mature adults endlessly hooked up and sucking on straws getting a bit suspect – one heaving human matrix nursing at the Starbucks’ mammary gland? Isn’t this dependency making us not just physically – but also emotionally flabby? Will we be found watching, mochaccino in hand, as the Tiger Mothers’ cubs leap forward, claws bared and make mincemeat of the Goldfish munchers. Will the humble Cheerio eventually be brought to task for having spelled the demise of the American empire? For an empire to crumble beneath its snack would be a miserable end indeed. The very origin of snacking is bad. 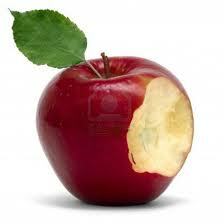 Look back to what is probably the most infamous snacking moment of all time – Adam and the apple. Had he been able to hang in there, (through the cool of the day) ‘til dinnertime, he would have saved an awful lot of people an awful lot of trouble. Renounce temptation – shape up. THIS BLOG NEEDS YOU: If you enjoyed this fragment of life, take a moment to post your comments or share. YOUR WORDS ARE GREATLY APPRECIATED. “I’ve just realised, there is something wrong with the Constitution.” These words echo through the darkness above our marital bed. They are hard to ignore, however ill-timed and as I come round to consciousness I feel irritatingly compelled to ask “Why?” as opposed to sinking down sensibly beneath the covers. It turns out that my husband has awoken me to express the very same idea I had already expressed two nights before, but whilst the lights were on and when it would have been reasonable for him to remember it. Apparently he hadn’t, so now the idea is his. These sort of interjections are not uncommon, with a penchant for barbed wire literature or grumpy literature as I gather it is also known, the desire to share some political or historical fact can just be too much for my beloved consort to contain. On the scale of ways to be woken up they tend to beat the enquiry “Are you awake?” Followed by “I can’t sleep.” and the scuffling sound of the search for a sleeping pill. I am hereby re-appropriating my idea, although I doubt very much that I am alone in having voiced it. The Pursuit of Happiness should be removed from the US constitution and erased from the American psyche and much happiness would ensue. Happiness is a highly ephemeral thing. All you have to do is realise you are experiencing a happy moment and in so objectifying it you have already stepped out of it and partially or totally ruined it. It is like realising one is falling asleep – the realisation jolts one back to wakefulness from delicious slumber. To constitutionalise the pursuit of anything as ephemeral as happiness is bound to bring discontent. Unfortunately, according to a World Health Organisation’s 2011 report, this appears to be the case. More than 30% of Americans suffer from Major Depressive Episodes (MDE). I have a healthy respect for life being tough and have long been reassured by a quote my father came up with during a time of what felt like infinite stress: “Life is that difficult stage between the cradle and the grave”. Sitting hunched up against a major deadline, with a sheaf of notes in one hand and a book on fascism and sexuality in the other, this provided some comfort and perspective. Given the ephemeral nature of happiness and the tricky nature of our existence, the likelihood of attempting to align the two in a daily apotheosis of joy and perfection is bound for failure – unless one has very low standards in which case one is probably not thinking about it at all and just bumbling along amiably, or maybe even happily. 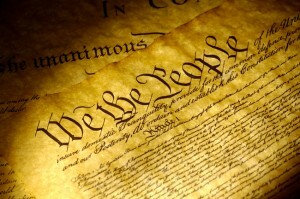 To feel entitled to happiness, an obvious next step to the value enshrined in the Constitution, is even more perilous. Unhappiness and the sense of having been cheated align all too well. Is it precisely the lack of the sense of entitlement to happiness that results in China scoring lowest, 12%, in Major Depressive Episodes in the same WHO report? The fact is that life and happiness just don’t work in synchrony without a degree of legwork to bring them together. So it was with delight that I discovered that Viktor Frankl, who has printed and sold more than 12 million copies of his book “Man’s Search for Meaning” agrees with me. 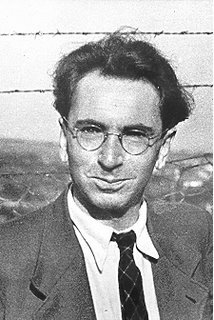 Viktor Frankl, the Austrian psychologist, who survived Auschwitz and developed the theory of “Logotherapy” describes his concentration camp experience and how his theories helped him and many of his fellow sufferers to live through the hardships of camp existence. “It is the very pursuit of happiness that thwarts happiness.” – he says. Happiness should not be pursued it should ideally ensue from a) finding meaning in our life and b) from the actions we take to support that meaning. Logotherapy which stems from the Greek word logos (“meaning”) is based on the premise that once a person can identify or ‘detect’ the current meaning to his life (this can change through time) then he will also find the mental health and strength to overcome life’s adversities be they large or small. The time has come to renounce the pursuit of happiness, to give up the chase and abandon the fast lane, fast-food approach. It is time to take the byroads and sit a while in a routier over a steak and glass of red wine. Build for happiness but, like with the Medusa, never look directly at it. And now just postscript – for the many therapists who risk messing our lives up even further – as if the Constitution were not enough. Frankl somewhat wryly describes the case of an American diplomat who came to his office in Vienna because he was discontented with his career and its foreign policy. After five years of psychanalytic treatment he had been told again and again that he should reconcile himself with his father because the US government and his superiors were nothing but father images. As it turned out he was genuinely frustrated with his career and a career change proved the correct solution. DEDICATED TO: A dear friend and all sufferers of what Winston Churchill frequently referred to as his ‘black dog’, or depression. I am unaccountably sad about the loss of small kite. 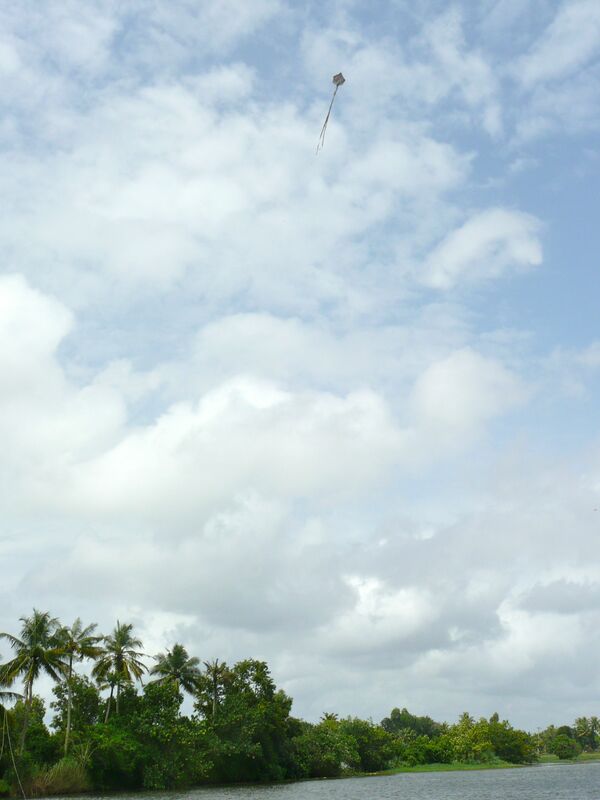 The kite, made of two slender twigs, some twine and Indian newspaper, had attached itself to our Kettuvallam (traditional cargo boat) as we puttered down the coconut-lined channels of the Backwaters. Suddenly it was there skipping merrily in the sky high above us, its elegant newsprint tails all aflutter. Its string had somehow become caught on the boat and having lost the hand of the boy who had made it, had adopted us. We hauled it in accessorising it with a plastic bottle around which we wrapped the length of twine. It was simply and beautifully made and what is more it really flew. Kite flying, in my experience has always been a disappointing activity. I carry a cold, grey image of my brother and myself running down hills as fast as our legs would carry us in the hope that the English weather would sweep our exotically coloured kites into the sky. When we would turn briefly in our helter skelter progress it would inevitably still be there, bumping along the ground, a mass of mud and twigs. As a result I had decided to bring this aerodynamic masterpiece, in all its recycled glory, back to Europe. For whatever reason I thought we would watch it flutter gracefully one last time which, had I had more kite flying experience, I would have known to be foolish given that we were surrounded by water. With one fatal twist it took a dive into the waters and despite jumping in to rescue it, it promptly fell apart. 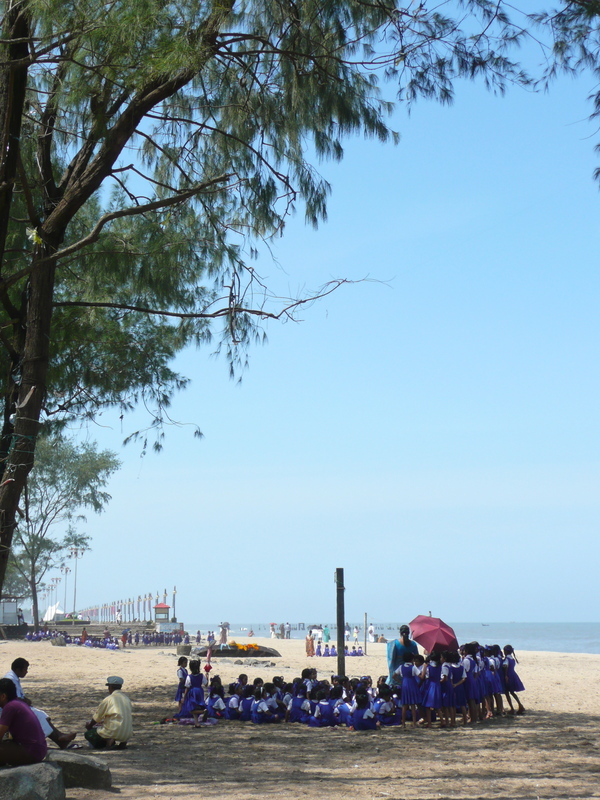 Transcending its fragility and aged newsprint it had borne aloft the enthusiasm shared by boys all over the Asian continent for kite racing, a tenuous thread rising above contentious borders and divides. I was sad to place its dilapidated remains in a waste paper basket and with it, the boy who had so skillfully mastered his craft and is probably even now engaged in arguing certain enhancements with his peers. It is evening the cicadas and monkeys have cooled off. We sit having a drink with our hosts, Viktor and Ranjini Dey on their veranda, fending off the affectionate advances of their one-year-old boxer. 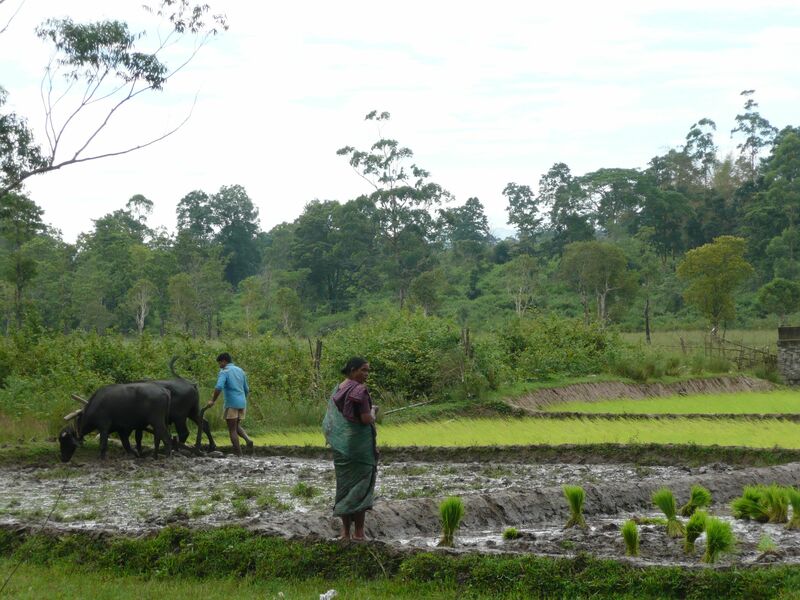 They ran a tea plantation for many years, and as our host puts it, were a ‘slave to the tea bush’. 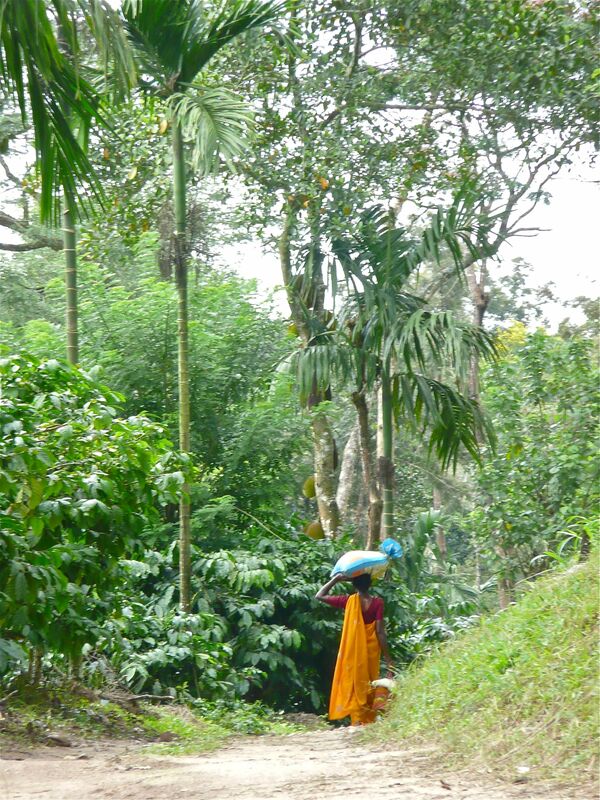 Coffee is apparently a lazy man’s crop, requiring harvesting only once a year. The ‘two leaves and a bud’ of the tea bush require daily picking and processing. The sheer amount of everyday labour requires one to maintain a school and hospital. Of course there are trials in the coffee business, ‘the monkeys are a perfect pest’* and the ‘leopard a perfect menace’. I long to incorporate any one of these comments seamlessly into the school pick up chatter when I return to DC. Will anyone notice? But if one fears slavery to the tea bush, one is shackled and bound when it comes to vanilla. I finally hold some respect for the prices that a vanilla pod fetches. Firstly the flowers have to be fertilized by hand as the bee that used to fertilize them no longer exists. This is, needless to say, a fiddly process and not always successful. All the staff over forty years were equipped with spectacles, much to their delight as a missed fertilization cannot be afforded. 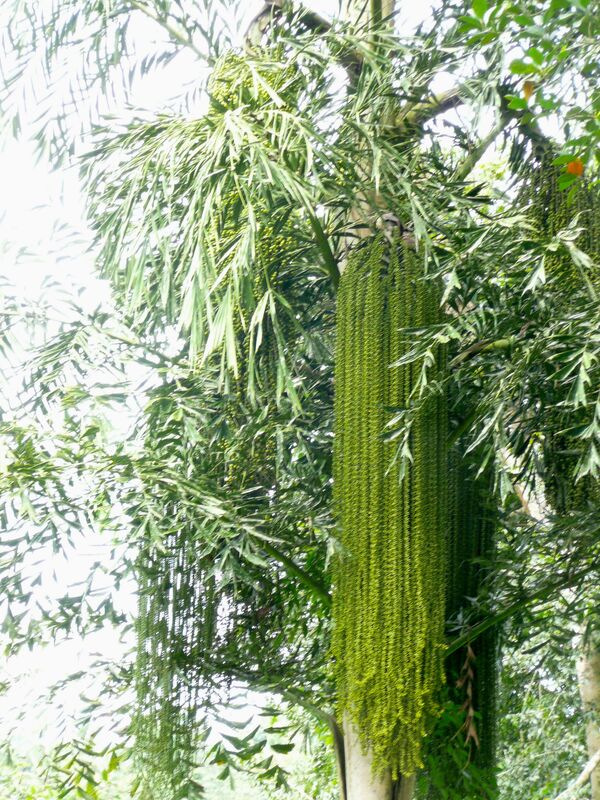 The pods then take nine months to develop during which period they have to be guarded against all sorts of maladies. Assuming the delicate pods make it to harvesting time, they then need to be picked and blanched at 65 degrees Celsius. Once blanched each pod is wrapped in a warm damp blanket for 24 hrs. It is then un-swaddled and laid out to dry in the sun before being wrapped in more blankets, dry this time, and placed in boxes for a further 11-14 days. After this each pod is massaged to stave off brittleness. How to assess the quality of your vanilla pod? a) One should be able to tie a knot in it, b) it should be dark brown almost black and c) slightly shiny. All this enables the proper crystallization process to occur. As our hostess remarked “How on earth did anyone devise such an extraordinary process and with fake vanilla essence being easily obtained from a by-product of wood pulp or tarmac is it worth it? Most palates have grown accustomed to the stronger flavour of its imitation. Sadly all the vanilla at Tranquil died this year due to a fungus and the pepper vines no longer fair well in the region as rainfall has fallen by 50% over the past 30 years. 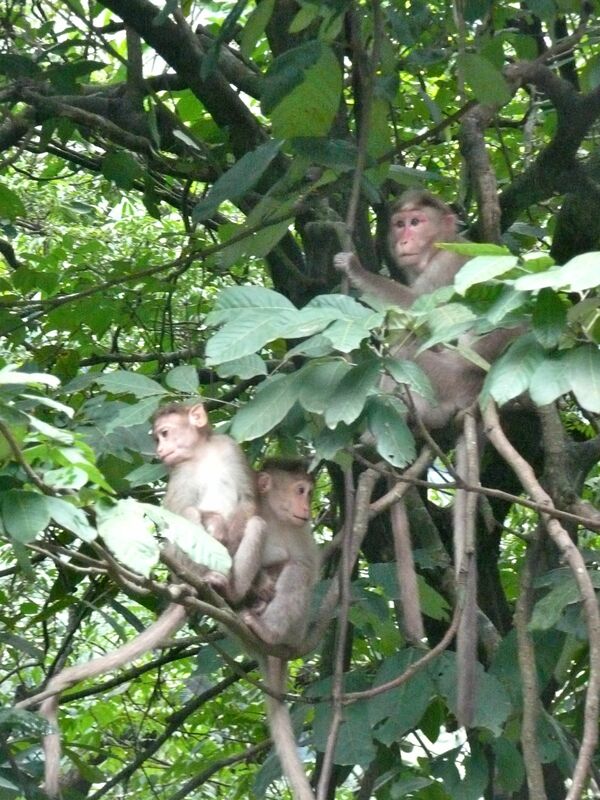 *It later transpired that the monkeys are not a ‘complete and total pest’. Our host’s daughter Nisha has been inspired by the Indonesians and is now producing and marketing a variety of coffee called Monkey Business. Like the Indonesian “Kopi Luwak’ which is the most expensive coffee available, the coffee beans have been digested and excreted. In Indonesia civet cats do the job, at Tranquil it is the monkeys. 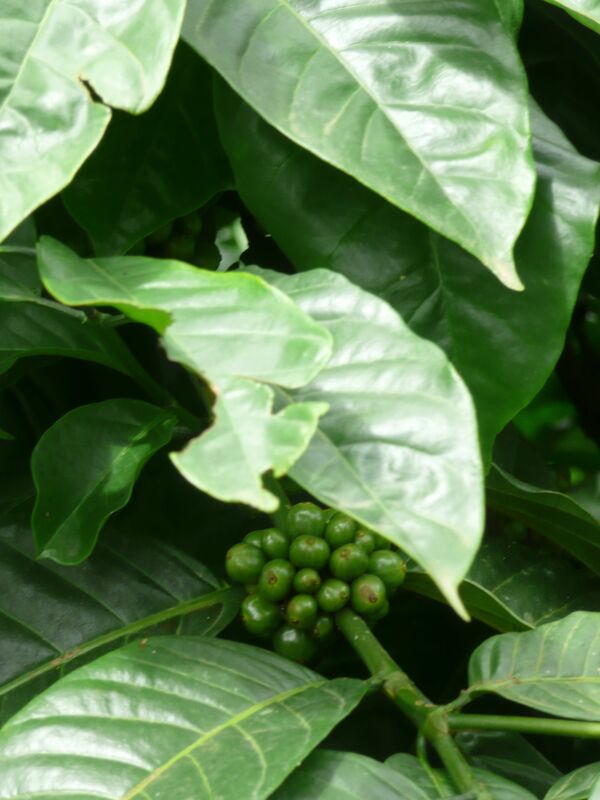 An enzyme in the monkey’s stomach reduces the acidity of the bean making for a very smooth blend. The beans are washed husked and roasted to produce this special brew and whilst the habit of collecting the “monkey’s harvest” is common at any coffee plantation; it is not common for it to be processed separately. Sadly she was out of stock of Monkey Business and our conversation wend its way to the ghastliness of a Barbie shop in Bangalore, our favourite animated movies and the impact of Kung Fu Panda II on her daughter’s bedtime. Her daughter, the same age as Eleanor, had just asked why she could not say ‘peanuts’ or ‘cashews’ at the end of her prayers as she was bored of saying ‘almonds’. (For Almonds read Amen). Our dinner conversation that evening probably encapsulates the best of the Home Stay Experience. It brings with it a mix of the untravelled, the totally foreign and exotic, intertwined with the universals that, whether on a coffee plantation or in Washington DC, affect us all. The answer to a good holiday is to throw money at it. This should safeguard against our typical holiday experiences that include Starvation in Serbia, Starvation in Senegal and even Starvation in Alsace-Lorraine which we neither of us thought possible. Another ingredient is not to be too clever, if somewhere is recommended as one of the top hideaway destinations in Asia, just go for it and so it is that we find ourselves 3.5 hrs from the Beach Hotel in Calicut (origin of the word Calico and where Vasco da Gama first set foot in the sand in 1498) and up in the Western Ghats which rise from the coast to meet the plateau of central India. We had been warned. Lovely staff at the beautiful, measured and tasteful Brunton Boatyard hotel in Kochi had been amply cautious about my plans to travel North. “Much enjoyment will not be had there’. After five hours on a train admiring water buffalo wallowing, buying Biryani through the window to discover we had no way of eating it and hanging out of the open door for the experience, we had to agree. 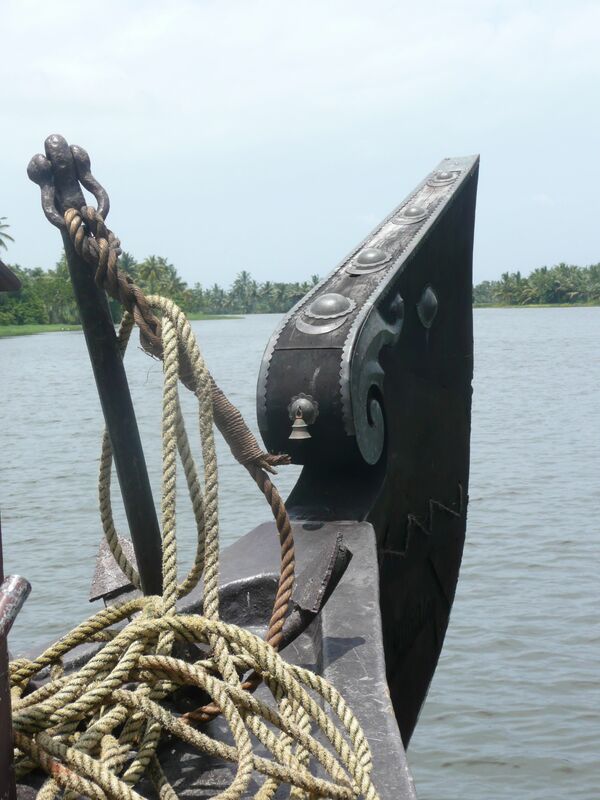 Calicut is not quite as charming as its ancient history of boat builders (Cleopatra’s barges are supposed to have been built here along with Admiral Nelson’s flagship), traders and adventurers would suggest. The little bottle in our bathroom confidently marked ‘Shamboo’ was one of the first indications that we were now on our own. Attempts to secure a glass of wine were painfully met and resulted in two tiny portions of acid port, the lime sodas we resorted to came with the offer of a spoonful of salt. The Malabar coast is the best place in the whole of India for seafood I reassured Emile. The restaurant we slogged to through the pouring rain had nothing but chicken. I began to empathize with the sentiment of a close neighbor in the US who was eloquently incredulous of our holiday plans. And so it is that we chose to wend our way up the monsoon battered road and through the banks of mist. 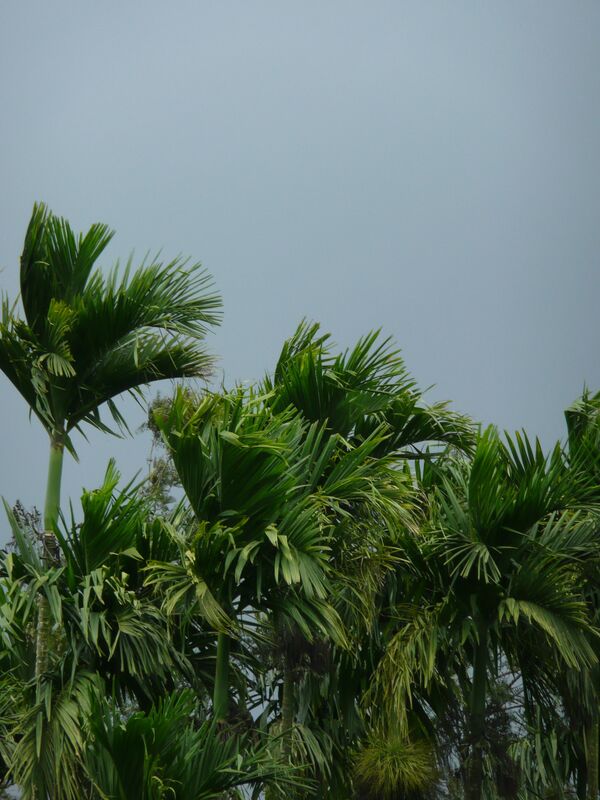 The coconut palms petered out to be replaced by the colourful revving and reversing of traffic congested hairpin bends. Up we ascended, observed by colonies of monkeys sitting by the roadside like old men enjoying the day’s comings and goings and so traversed the Ghats emerging suddenly in the sunlight of the plateau. We alighted at Tranquil, a beautiful home set amidst a 600 acre coffee and spice plantation. After a lunch that our hosts had saved for us, we set off on a walk through the plantation, climbing higher and higher past the dripping coffee bushes and fermenting jackfruit. It was at this point that Emile was allowed to be very masculine and I to be very feminine, also an essential holiday ingredient. Emile found a leech on his leg and examined it with scientific curiosity. I found a leech on my foot and let out four almighty shrieks. Leech number two was met with three shrieks; leech three with two shrieks and four with one shriek. I have not, managed to traverse the one shriek threshold and tend to let out a prolonged one of several pitches to make up for the fact that I can no longer resume the two shrieks without looking as though I am regressing. Despite our bloodsucking friends who were along for the ride, we continued up the path and clambered onto a massive pink granite outcrop commanding views across all the surrounding valleys. A strange assortment of cactus and ferns grew from its crevices. Monkeys flung themselves from the branches and cicadas deafened themselves. On and up we climbed, coming in the middle of nowhere upon what looked like one man bus stop, a corrugated iron contraption with a wooden bench. An elderly gentleman in round Ghandi-like spectacles stood up and greeted us somewhat apologetically before shaking his newspaper and seating himself again. Rather to our disappointment he had vanished when we later made our way down. We have flown the nest for the summer. Our flight – the first without a pushchair/stroller in nine years – was punctuated by my being the only one to be disorderly with our supper trays. I pour wine over both myself and Eleanor “you’ve got it in my underpants”, drop sweet corn salad on my silk top and a raspberry cheesecake on both my silk top and my son. I then lose a buttered roll to BA’s carpeting and am forced to retrieve it with my toes as it is all Alexander will eat. Heathrow 6am, blue skies and several hundred jet lagged passengers trying to board the transit train like bleary lemmings. “There’s a queuing system” points out a Heathrow ground staff member bleakly but firmly. We have arrived. 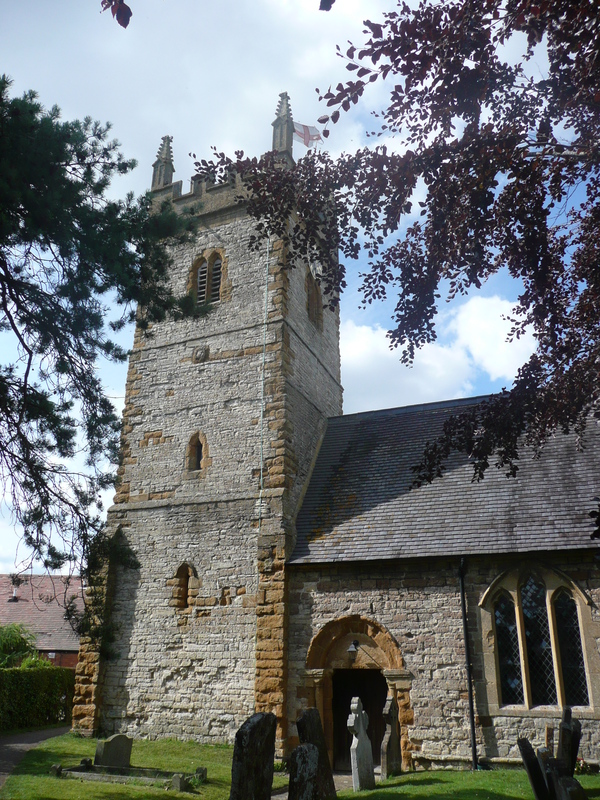 One and a half hours from Heathrow in a right-hand drive car, on left-hand drive roads, re-acquainted with a gearstick and the orderly style of English drivers – we find ourselves in Halford, a pretty little village in Warwickshire. Our hostess promises to leave the door ajar if she is off fetching my godson. “I have always loved squalor but this defines a new level” she has warned with charming gaiety. I am so heartily tired of people automatically apologizing for the state of their houses, enforcing a fake idea of how we should all be living– that I am already full of happy expectation. The problem is one can only really do good squalor if it is splendid and that requires a suitable backdrop. Splendid squalor is a quintessentially English thing and a hall mark of good blood. It is designed to confuse the foreigner as is the pronunciation of the name St John (singian) and of half the country place names of England. These are probably all rooted in an ancient desire to wrong foot and thereby expose under-cover island invaders. 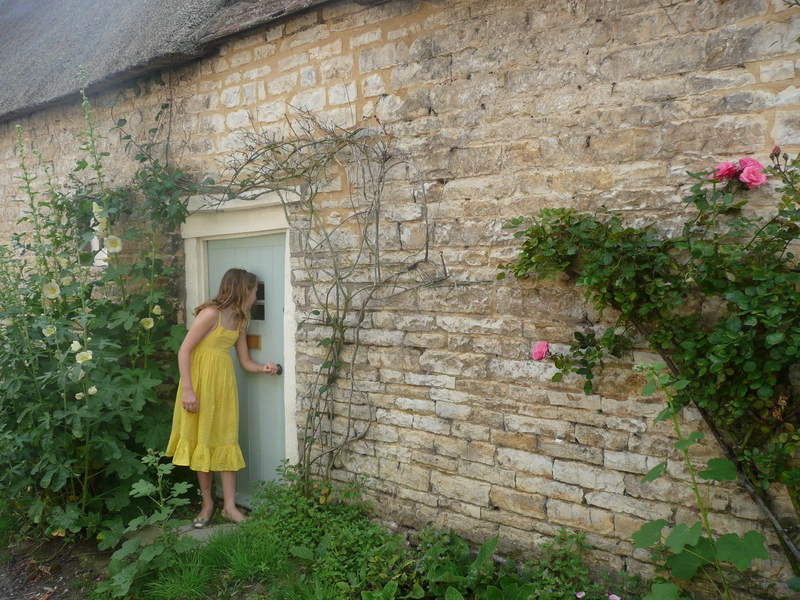 We drive through the covered threshing floor and into the courtyard of the house, stables, outbuildings, abandoned pig sties and a trampoline. The door is indeed ajar and a mix of violent high-gloss yellow with someone’s later attempt to apply tasteful Farrow and Ball in a colour that is so muted and clever that it cannot be described. The lock holds a key that has never had to share quarters with an assembly of loyalty cards that only prove our total lack of loyalty to anyone. The kitchen is paved with gigantic old flagstones. Of course fresh from Bethesda, we cannot get over the antiquity of it all. The sandstone mullioned windows that frame a solitary goldfish in a well forgotten tank, the twisting stair cases, the corridors that sinew off in different directions with doorways stepping up and down into further rooms to be explored. My godson returns, a shambolic head of white curls and English school uniform, collar just a little oversized, and moss green V neck Shetland. And so the reunion begins, scampering limbs, yells of lament, love, hate and indignation. Drinks, peace reigns. Three jet lagged heads sunk upon their crisp cotton pillows under the eaves. Some glasses of wine, the smell of roast chicken and fennel drifting onto the terrace and beatific as this is, it is still England so we soon retire to the warmth of four walls. But our chicken is soon interrupted by indistinct noises from the garden. It turns out that the bat inspectors have arrived. The derelict barn that my hosts want to restore is suspected of housing bats. My hosts fear is that these may turn out to be brown long-eared bats. The inspectors have come to sit in the shrubbery for three nights to evaluate the risk of the renovation to English flora and fauna. If the bats do turn out to be brown long-eared bats they will require a home of equivalent volume to be constructed or as my host comments, drily ‘a nice apartment in London’. My old university friend, J, suspects the bat inspectors of actually using ‘bat evaluation’ as the pretext for conducting a bucolic extra-marital affair and fears it will end like an episode of the BBC series Midsomer Murders in which murders occur over clotted cream tea at the village fete. 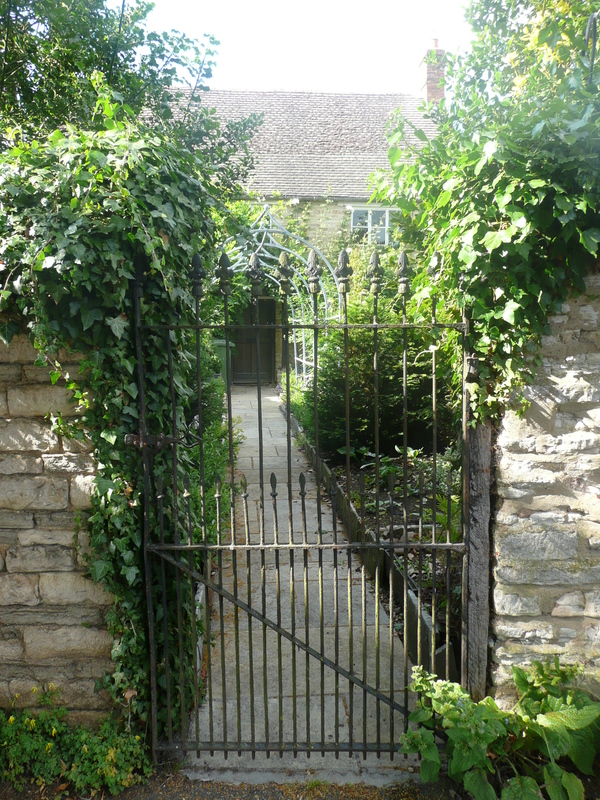 Halford is the perfect setting for Midsummer Murders, a winding lane, hollyhocks, thatched roofs, an Elizabethan manor house, the Old Forge, The Vicarage and of course the church. From the church’s tower, the St George’s flag occasionally billows in the late afternoon sun and beneath its shadow lies the churchyard complete with an old stone angel straight out of The Church Mice. The children play hide and seek amongst the dimly legible tomb stones, Eleanor hides in a yew tree, an essential feature of every English churchyard, and Alexander discovers why one should not hide in a holly bush. “Are people buried here?” asks Cecilia, “Yes” says J and the fun continues. 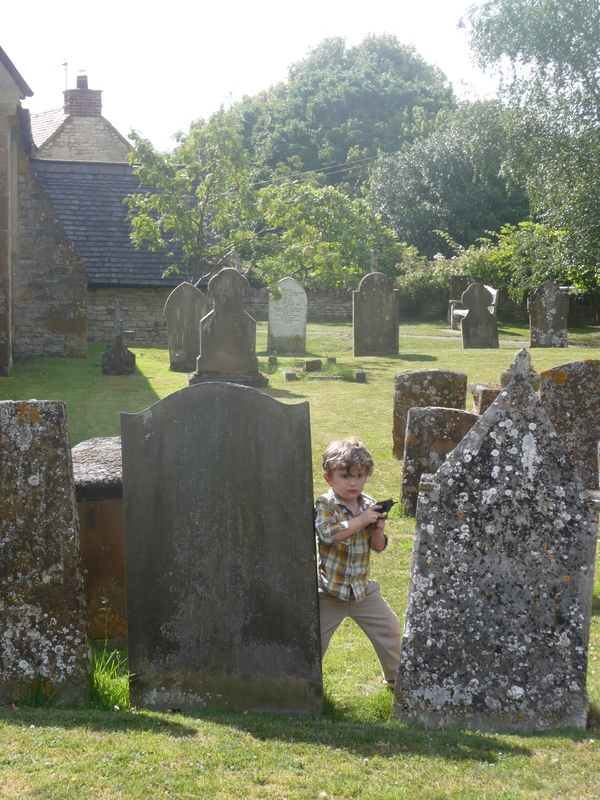 Alexander now sports a pistol and pulls some rather accomplished James Bond moves from amongst the grave stones. Only last Saturday a Dutch friend living in Bethesda told me how her pediatrician had reprimanded her for confirming that people got buried. Her daughter had chosen her annual visit to put this question to her mother. “Don’t tell her that, she might get scared!” How did this fit with the blinking skulls and plastic tomb stones of Halloween? We can’t work out the logic but I feel sure that playing hide and seek in a pretty English graveyard will ward off all sorts of therapy and bereavement issues. So our idyll here is near a close, so far no murder, just a little battiness and lot of happiness. For more on how we do or don’t tackle death and are generally turning our children into ‘teacup kids’ as they are being dubbed by some of America’s universities – in other words fragile creatures incapable of dealing with reality, see The Atlantic Monthly’s wonderful article July/Aug 2011 “How the Cult of Self Esteem is Ruining our Kids”.